Teaching Authors--6 Children's Authors Who Also Teach Writing: IMAGINE! In but twenty-four days, 2018 will have come and gone. I’m amazed to report: I made it! My Can-Do/Anything-is-Possible Spirit appears surprisingly intact, only a smidgen worse for the wear this past year. I of course remain immeasurably grateful to those who kept me keeping on: my family and friends, my fellow bloggers, my Chicago Cubs – in particular David Bote who pinch-hit a walk-off grand slam at the bottom of the ninth to beat the Nats 4 to 3 this August, but especially my students and writers – my storied treasures who kept me focused on doing what I love and loving what I do. I’m still in the Hope Business, writing children’s books as well as teaching and coaching children’s book creators who do the same. So did so many beautifully-written inspiring children’s books, from Khaled Hosseini’s SEA PRAYER, Lesa Cline-Ransome’s FINDING LANGSTON and Mandy Davis’ SUPERSTAR to Minh Lê’s DRAWN TOGETHER, Jarrett J. Krosoczka’s HEY, KIDDO and Deborah Mills’ LA FRONTERA. Best of all, though, when I needed it most? by Lauren Castillo (Candlewick Press), gifting me with my course of action for 2019. Poet, performance artist and activist Herrera moved with his migrant family from Mexico to the U.S. when he was a small boy, saying goodbye to his amiguitos. In time he learned how to read and write in English, grabbing words he’d never heard and sprinkling them over a paragraph to write a magnificent story. He served as the 21st U.S. Poet Laureate from 2015 through 2017, reading the book’s poem on the steps of the Library of Congress in Washington, D.C. If you don’t believe me or the flap copy, look and listen for yourself. I plan to steal away and do just that beneath tonight’s New Moon, once I upload this post. What I can do. What I can be. What I can become. What matters. Just name it. IMAGINE is my 2019 verb. I hope you’ll consider making it your verb too. As always, thanks to our Poetry Friday connection, Elizabeth Steinglass. It is a wonderful book, inspiring for young children as well as all the rest of us! (I loved Drawn Together & Hey! Kiddo, too! Here's to your 'imagine' in 2019! Thanks for the book recommendation, and for sharing the video clip, Esther. 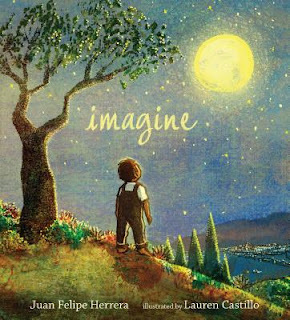 I can't wait to see the book IMAGINE for myself! Inspirational! I'm a big, big fan of the Gilmore Girls, too. Thank you for this imagine strategy! To 2019! Such a hope-filled post--exactly what I needed to read today! Thanks for the call to imagine, Esther. Thanks Buffy, Bobbi, Marti and Linda B. for taking the time to comment! I'm glad you found both post and Juan Felippe Herrera's IMAGINE inspiration. What a beautiful, inspiring post! Yes! Imagine! Imagine! I love that word. Thank you for this lovely, inspiring post! Simply wonderful, Esther! Juan Felipe Herrera's picture book of poems, Calling the Doves changed my life. It was in this book that I saw you didn't have to tell a whole story for readers to understand the whole story, via poetry. It was like lightening crashing, this new understanding.